Hail and well met, brave sir. Click here to play! Tales have been told of your deeds throughout the lands. It was you who stole the jackpot of the 5-reeled beast, was it not? And you who took the head of the Black Jack, and his 21 men-at-arms? Yes, you are indeed worthy. That is why you must go on the Quest of Kings! Who else is better suited to ruling the lands of Slotalia? Your cousin Lossdred the Unfortunate? I think not. Your sister, Magdalene the Risk Averse? She's not really Slotalia people, is she? So, you see, you are the only qualified individual to take on the Quest of Kings. The only one who stands a chance of taking the 4 royal artifacts to the Princess and claiming a place next to her to rule all of Slotalia. In the Quest of Kings slots, you are a knight who must journey the lands in search of the ancient Scroll of Kings, the Sword in the Stone, the Royal Crown of Extra Kingliness +5, and the Red Rose of Ultimate Seduction. The ultimate goal of your quest is the hand of the Princess in marriage, which will bring you riches and power beyond your wildest dreams. 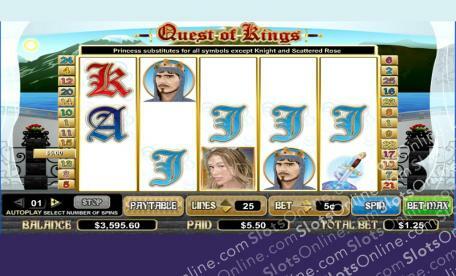 Play the Quest of Kings slots now to set out on the path of destiny! The Red Rose symbol is the scatter, and it pays out on the total bet when 2 or more land on the reels. 3 or more will also trigger the bonus round. The Princess symbol is wild, and it can substitute for any symbol other than the scatter. There are two bonuses. The first is the bonus round that is triggered by 3 or more Roses on the reels. In this game, the player chooses 3 of 5 towers to try to find the Princess. A random prize is awarded if the Princess is found, and a consolation prize is awarded if she is not found. The other bonus is triggered when the Knight symbol lands on reels 2, 3 and 4. In this bonus, the Knights turn into Princesses, and additional payouts are calculated for the new lines.